On June 3, two Space Shuttles were on the move. The Enterprise flight model took to the seas on a barge in an attempt to reach its new home, the New York based Intrepid Sea, Air & Space Museum. At the same time, the Shuttle replica Explorer made its way from Houston’s Clear Lake to the visitor center of NASA’s Johnson Space Center. 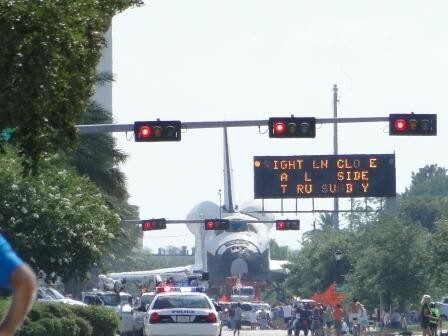 The Shuttle mock-up Explorer slowly made its way down Houston’s streets (Credits: Laurie Danas). Explorer had a bit of a tight fit down some of Houston’s streets. Trees had been trimmed along the route in preparation, but it became clear at the first intersection that the stoplight posts would need to be removed as well. With one team removing posts in front of the Shuttle and another replacing them behind it, the ship made its slow way down NASA Road 1. Five hours later, Explorer finished its one mile trek to its new home. 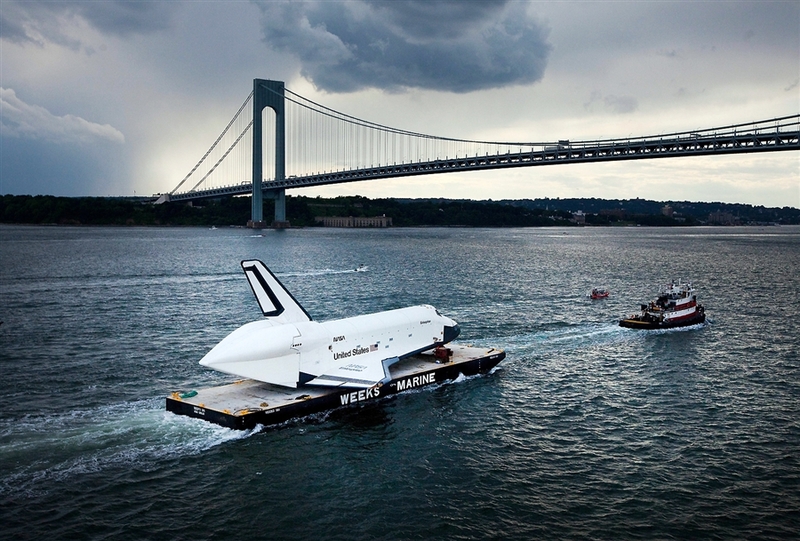 The Space Shuttle Enterprise on its way to its new home (Credtis: Michael Nagle/Getty Images). 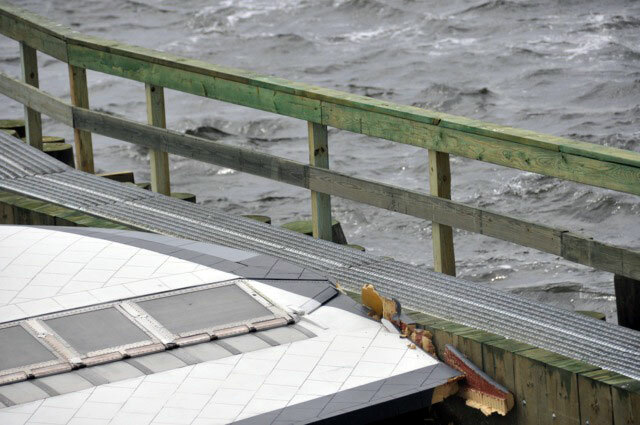 While Explorer reached its destination safely, high winds caused Enterprise’s voyage to be prolonged after it side swiped a bridge guiderail, minorly damaging the Shuttle’s wing tip. The Shuttle docked for the night in Bayonne, New Jersey. It will likely finished its journey on June 6. Enterprise’s wing was slightly damaged when it dragged against a guiderail (Credtis: Dennis Jenkins).